Edwardsville – Page 3 – Welcome to Wyandotte Daily! 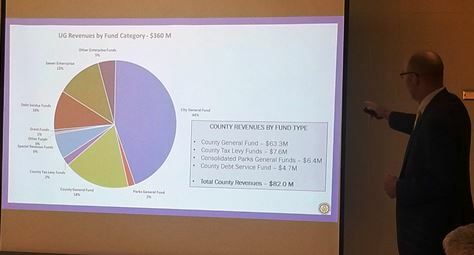 About 30 people, including the mayors of Bonner Springs, Edwardsville and Kansas City, Kansas, attended a presentation Monday night on the Wyandotte County budget. 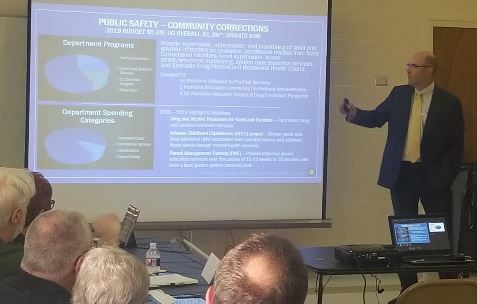 The presentation was held at the George Meyn Community Center, Bonner Springs. Doug Bach, UG administrator, spoke about the Wyandotte County budget, which was passed Aug. 2. The Wyandotte County mill levy rate remains the same at 38.880, while valuations have increased an average of 7.9 percent. Bonner Springs Mayor Jeff Harrington, Edwardsville Mayor John McTaggart and Kansas City, Kansas, Mayor David Alvey attended the meeting. Four members of the Edwardsville City Council and four members of the Bonner Springs City Council attended the meeting. Only a few questions were asked at the meeting. An architect’s drawing of the new Hard Rock Hotel development at Village South, 110th and I-70. The Hard Rock Hotel is coming to Edwardsville, Kansas, according to officials at Monday night’s Edwardsville City Council meeting. The 231-room hotel with a meeting space will be at the Village South development at 110th and I-70, said Jon Monson, a developer who is part of the ownership group. The hotel’s anticipated completion date is in 2020. Village South is just to the south of the Village West development. The Edwardsville City Council on Monday unanimously passed a Community Improvement District for the new hotel and development, with a 1 percent sales tax in the district. “I am really excited, this project will be a big asset to our community,” said Edwardsville Mayor John McTaggart. Kevin Lee, a lawyer with Polsinelli who is representing the owners, said this project has been in the works for some years, and the CID is the latest part of it. An initial CID was approved previously, and there are now three CIDs for the project, he added. Lee said the developers are still working on plans for an events center subject to approval by Edwardsville planning and zoning that will decide how big the events center will be. He added it is not a convention center, but an events center. 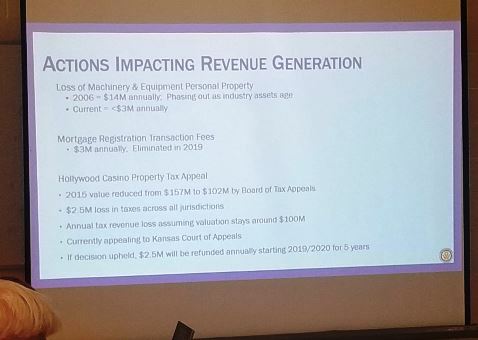 For financing, the hotel development project plans to use tax-increment financing, the CID and a transient guest tax dedication. According to a public notice, it will be a pay-as-you-go project, paid in part by bonds funded from sales tax revenues and in part from private equity and debt. The Edwardsville Council approved raising the transient guest tax from 6 percent to 8 percent. The estimated cost of the project is still being worked out, Lee said. The public notice published Aug. 9 in the Wyandotte Echo for the Edwardsville CID meeting listed the projected cost of the first CID development at $19.2 million; the second CID development at $63.39 million; and the third CID development in the project at $13.1 million. The development group is the Compass Commodity Group III LLC. Mayor McTaggart said original plans for this Village South project were a La Quinta and a Holiday Inn, with a restaurant. Then that was changed to a 208-room single hotel with Hyatt, including a convention center and other development. “Even before they changed to a Hard Rock, the impact of development on Wyandotte County was going to be pretty big anyway,” he said. He believes this announcement will have a major impact on development in Edwardsville. Mayor McTaggart also said that developers are currently looking at two restaurants with the Village South project, one a rooftop on top of the 10-story hotel, and the other possibly in the events center area. Currently, the developers are discussing an events center of about 39,000 square feet, he added. The council on Monday night also advanced a bond issue for the project, and they will be considering the bond issue at the September council meeting. A public hearing is scheduled at 7 p.m. Monday, Aug. 27, at Edwardsville City Hall, 690 S. 4th St., Edwardsville, Kansas, on creating a community improvement district and authorizing a CID project for the Village South project. If approved, this would add 1 percent in sales tax within the district. 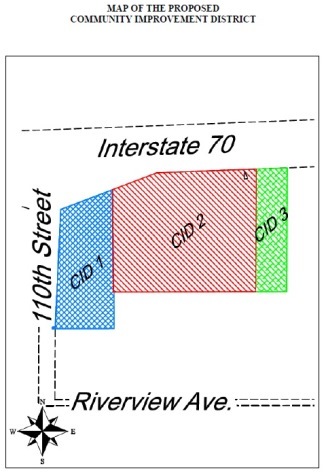 The Village South area is at the southeast corner of I-70 and 110th, south of I-70, east of 110th Street and north of Riverview Avenue. There are three different CID sites at the Village South area. The Village South development contains a hotel, conference center, restaurant, retail sites, infrastructure and other commercial uses.